The Liquid Lounge at the Aria is an adults’ only pool club that is relatively small compared to some of the others at 16,000 square feet, and tucked in behind the Aria resort’s three other pools in a world all to itself. This pool has a more chill atmosphere – if you’re looking to get faced and rage we’d suggest other dayclubs such as Encore Beach Club or Marquee Dayclub. Upon arrival, guests can sink into one of Liquid Pool’s 8 grand private cabanas, each of which is equipped with a 40” flat screen TV and mini fridge. Those seeking a more integrated experience can relax on one of the chaise lounges or day beds that line the 1,200 square-foot main pool. The entire 16,000 square foot property is internet-ready, and boasts hand-crafted wicker furniture designed by Janus Et Cie. Liquid is a high end pool at the Aria that has less of a “dayclub” atmosphere and more of a loungey “pool party with music” vibe. Minimums are generally cheaper than most other dayclub pools. Free champagne for ladies on the guestlist from 11 am – 1 pm. Check out the 32 ounce cocktail special for $30. Where is Liquid Pool located? 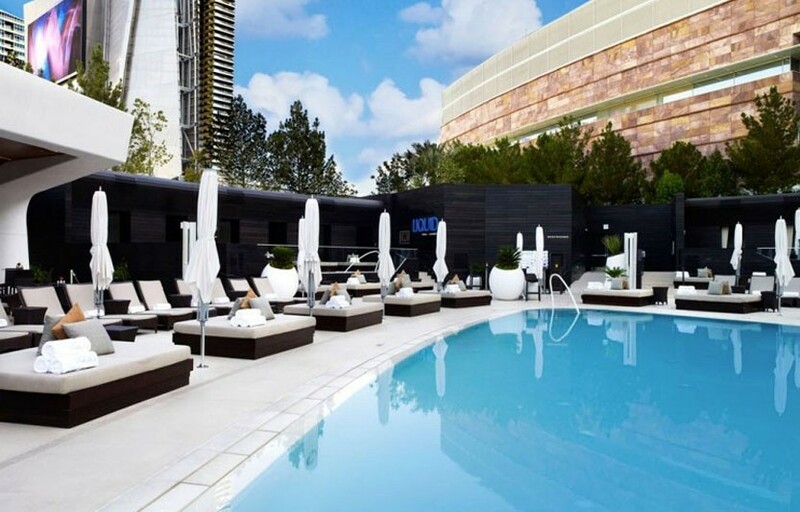 Liquid Pool is located at the Aria Hotel & Casino near the Citycenter complex. How much is cover charge at Liquid Pool? On most days, admission is $10 for women and $20 for men, while Saturday’s admission is $20 for women and $40 for men. There is a guestlist available. How long will I have to wait at Liquid Pool? Liquid is one of the less crowded pools so you typically won’t have to wait much unless it’s a holiday weekend or special event. When is Liquid Pool open? Liquid is open daily from 10:30 – close (usually around sundown). What are the best days to go to Liquid Pool? Wednesday is industry night. Fridays and Saturdays are pretty standard. During the summer we would highly recommend you go to Thursday nightswim at Surrender – it’s astonishingly fun. What is the dress code at Liquid Pool? Pool/beach attire. Swimwear is strongly encouraged. How much do drinks cost at Liquid Pool? Mixed drinks / cocktails start at $16, Beers $8, Shots $10, and Bottles start at $450. Liquid will typically use local resident DJs. What type of music do they play at Liquid Pool? Usually Electronic music but will sometimes have top 40/ hiphop as well. Where can I find an list of upcoming events / DJs at Liquid Pool? You can download the Discotech app to see upcoming events, get on guestlists and book cabanas/tables at Liquid. You can also visit Liquid’s website for a current list of upcoming events. When does Liquid Pool open for the summer? When does Liquid Pool close for the summer? Liquid Pool’s season usually starts sometime in March and ends in November. Exact dates vary year to year, depending on weather. We’ll post events on the app as soon as they are available – check our app for updates! In which hotel is Liquid Pool located? Liquid Pool is located in the Aria Hotel. Looking for VIP offers and comps? Check out URComped.com to find a Casino Host at Aria.